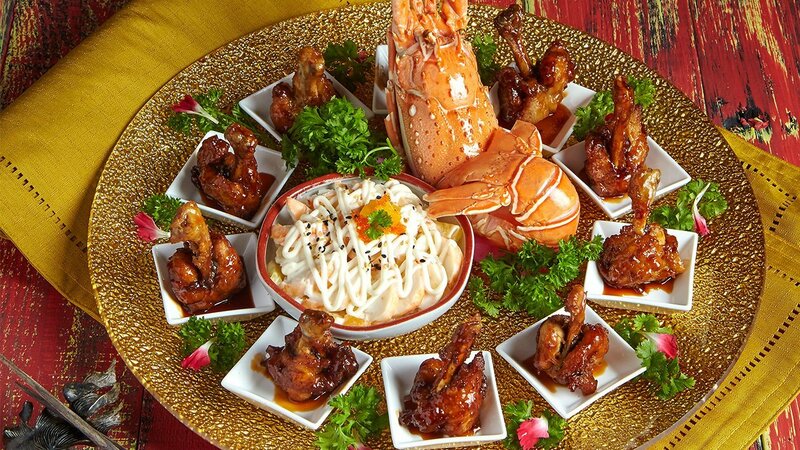 This Lunar New Year, double the indulgence with this Double Happiness Appetizer Platter. Let your guests savour the fruits of the sea with this deliciously refreshing lobster salad alongside pineapple chicken wings glazed in Knorr’s signature honey sauce. Use a bamboo chopstick and poke the lobster from the back through its head, place it in the steamer and steam for 25mins. Soak the steamed lobster in ice water and let it cool. Use scissors to cut open the soft shell at the belly and remove the flesh. Cut the flesh into slices. Arrange the lobster slices layer by layer in a small mixing bowl, then lay the peach cubes. Place a plate upside down over the bowl and flip the plate and bowl over so that the ingredients are transferred onto the plate. Drizzle Best Foods Honey Mustard Dressing, scatter pomelo pulp and fish roe. Push down both sides of the flesh of chicken mid joint wings with a knife. Ensure the flesh is still attached to the bones at the bottom. Rinse the chicken mid joint wings, marinate with chicken seasonings powder and corn flour for 30mins, set aside. Deep fry chicken mid joint wings till cooked and golden brown. Sweat Rock Sugar Honey Sauce, add the chicken mid joint wings and pineapple cubes and stir fry till fragrant. Plate chicken mid joint wings beside the lobster salad, sprinkle sesame seeds and serve.